A medical school focused on preparing and educating tomorrow’s physicians needed help getting their message across. 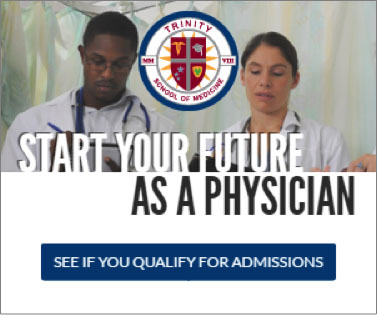 With small class sizes, a supportive faculty, and a patient-centric approach to medicine, Trinity has established itself as a respected institution in the world of health education. They turned to Cardinal for help in improving their yearly matriculations, while keeping their cost per lead down. At the same time, they wanted our team to help improve their brand reputation and get their name in front of a wider audience. Here’s what we did to make that happen. Becoming a true leader in an industry means ensuring your messaging reaches far beyond your own digital channels. If you want people to have a certain opinion about your brand, you need to control the conversation. That’s exactly the approach we took with Trinity. With so much unique perspective and input to offer to the health education world, we knew we had plenty of content to produce and share across the web. We got to work finding reputable resources and sites to have our client contribute to and get cited on. These citations and inclusions not only got the Trinity brand name referenced in reputable sites, but they also added coveted backlinks to Trinity’s site. These backlinks signal to Google and other search engines that our client is respected by other influencers, and should be rewarded accordingly with higher search rankings. By expanding our client’s reach to external sites, we also increased the likelihood that their prospective students would find them at various parts of their buyer’s journey. 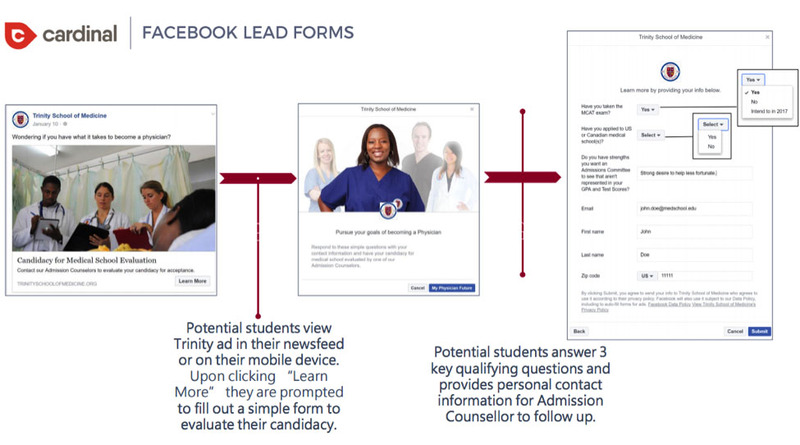 For example, prospective students who previously visited Trinity’s website were likely already familiar with our client’s school. But what about those prospects much earlier in their journey? How do we target them? Through a highly-targeted PR campaign that got the Trinity brand in front of key audiences across the web, we could ensure that prospects in every stage of the buyer journey were made aware of Trinity, their offering, and their respected standing in the medical world. SEO is a highly complex and recurring strategy. To help Trinity increase the number of qualified leads to their site, we knew they had to rank higher for certain keywords. We conducted thorough research to determine which key phrases their prospective students use during their searches, and then prioritized these terms to help our client see fast, long-term results. 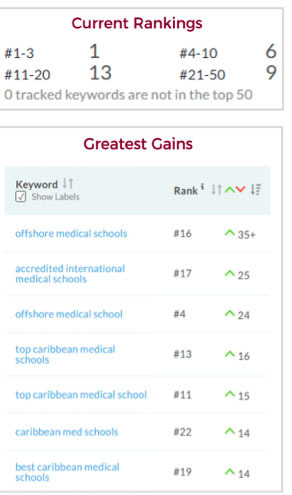 Prior to partnering with us, Trinity’s site was not prominently displayed in search results for such terms as offshore medical schools, accredited Caribbean med school and others. SEO can only take you so far in your marketing. While organic approaches are key toward long-term success, if you want to see results and a high return on your investment, you have to add paid search into the mix. Seeing as we had already developed a robust keyword list for Trinity’s SEO strategy, in order to shift those words toward a paid-search campaign, we had to compile a comprehensive negative keyword list. Negative keyword lists allow us to lower ad spend and CPC rates by ensuring our clients’ ads don’t appear in front of audiences who’d never become a qualified lead. 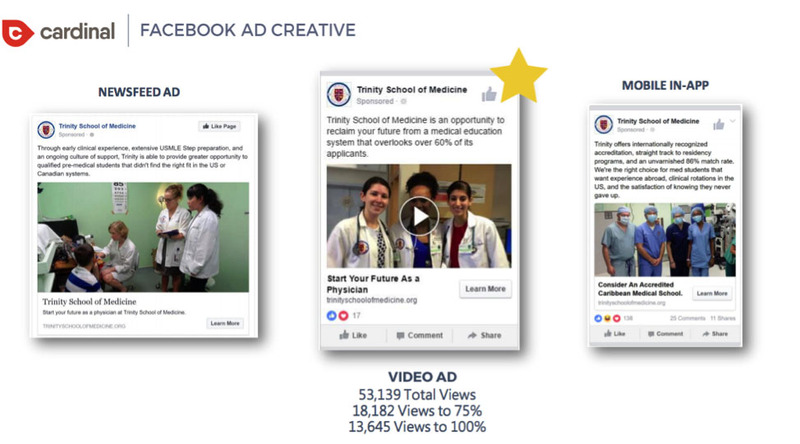 To complement this strategy, we incorporated display advertising as well, designed to keep the Trinity brand name top-of-mind for prospective students. We then displayed these ads across the web on targeted sites using three different strategies. 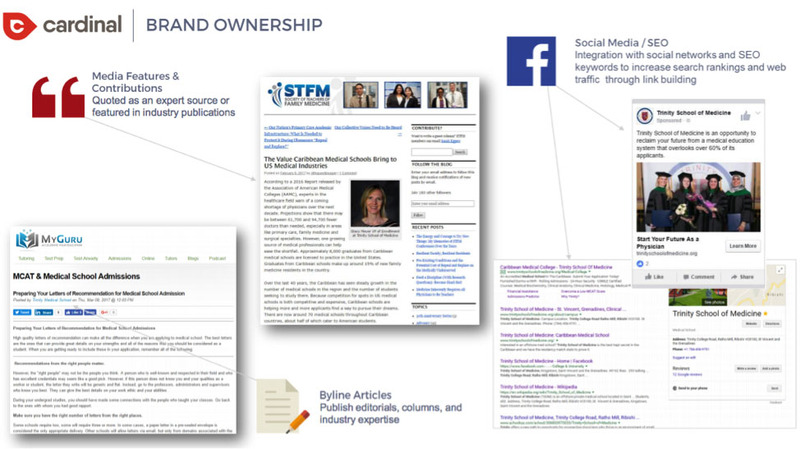 Contextual Keyword: These ads would appear on websites that had content related to targeted keywords such as medical test scores, admission to medical schools, or financing and loan-related content. 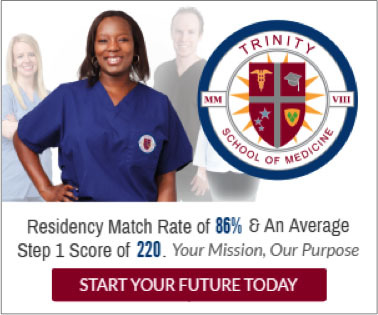 Site Placement: Our display ads appeared on sites we deemed highly relevant to Trinity’s core prospects, including sites focused on medical information and studies, prominent forums and blogs, as well as sites related to medical school and admission. Remarketing: Our ads would appear across the web for people who visited the Trinity website but had yet to complete a desired action. Each strategy we implemented resulted in impressive gains for Trinity across a variety of goals, all of which have led to a 12% increase in applications from qualified leads in Q1 alone. With our foundation now in place, our sights are set on reaching audiences higher up in the funnel by further building brand awareness and employing an aggressive remarketing campaign.